This frontispiece serves as a guide to the reader of this volume. It depicts two scenes: the trial of William Howard, Viscount Stafford (1612-80), who was accused of plotting regicide in the Popish Plot; and his subsequent beheading. Stafford (marked E) was put on trial in November 1680 at Westminster Hall; King Charles II was said to be present (see F – ‘the K’s [King’s] Box’). The trial was said to be ‘a great show’, something that the frontispiece certainly depicts – both Lords and Commoners alike attended. On the evidence of witnesses, Stafford was sentenced to death by beheading in December of the same year. 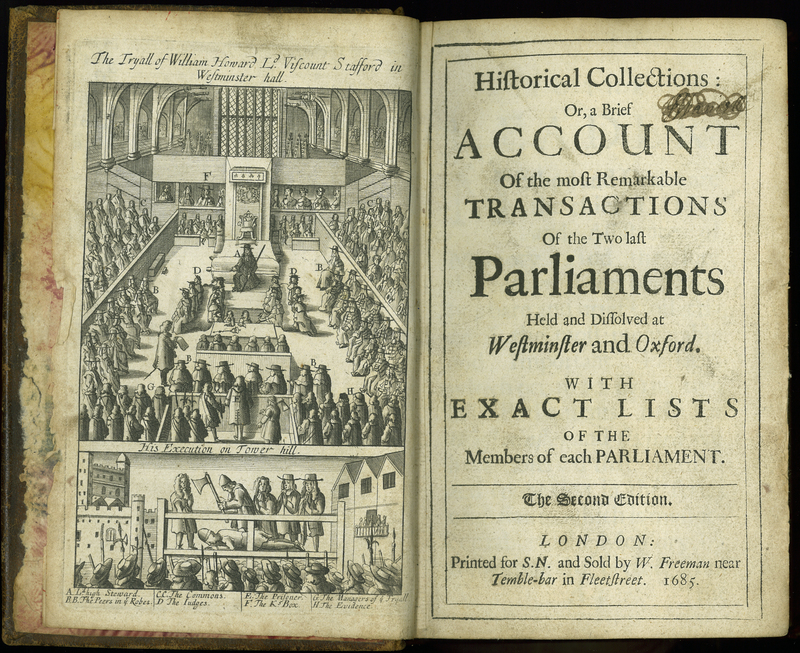 ___, “Historical Collections: Or, a Brief Account of the Most Remarkable Transactions of the Two Last Parliaments Held and Dissolved at Westminster and Oxford. Second edition,” ourheritage.ac.nz | OUR Heritage, accessed April 20, 2019, http://ourheritage.ac.nz/items/show/10689.